These Icom Wireless Transceivers offer simple operation for instant communication. This equipment is specially developed for delivering loud and intelligible audio even in noisy environments. In case, if this transceiver gets dropped in the water, it comes up to the surface so that you can easily retrieve it from the water. These Icom Wireless Transceivers are designed with rugged bodies and hence, they keep on working even after submerging. The IC-F3003 series is so easy to use there's no special training required. The few knobs and buttons are generously sized for easy operation and are designed to provide non-slip,positive action - even while wearing gloves. A new high efficiency FET of the lC-F3003 series reduces consumption current and provides 20 hours* of operating time with the BP-265, 2000mAh battery pack. 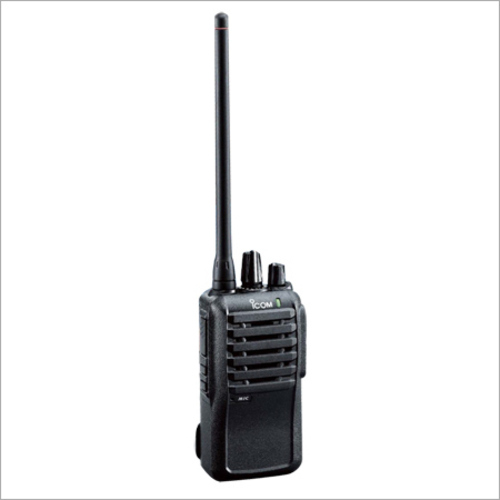 Even when used with the BP-264, the radio offers 14 hours* of operating time. While the radio is a compact unit with a height of only 111mm, the radio is tested to dust protection and water resistant equivalent to IP54 and 11 categories of MIL- STD-810 environmental test. In short, the lC-F3003 series is built rugged! 2-Tone and 5-Tone signalings give you selective calling, quiet stand-by and other convenient functions with programming. The radio âstunâ function disables a radio over the air and the âreviveâ function restores the stunned radio.